We had the most beautiful weather in Blighty on Sunday. It was bright and breezy with sunshine that warmed your bum when you stood in it; basically, a perfect autumn day. 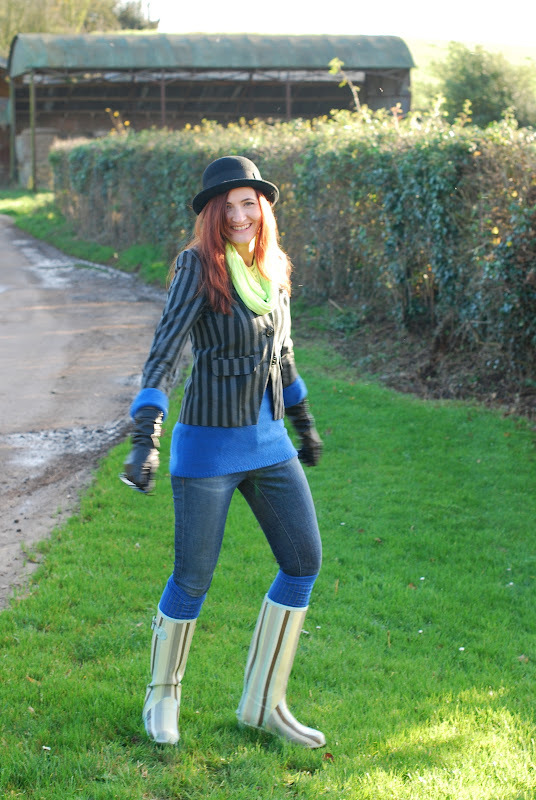 I wore this to watch my brother taking part in a cycling race: I’m glad I wore my wellies as it took place in the grounds of a country house… lots of grassy verges and muddy patches. 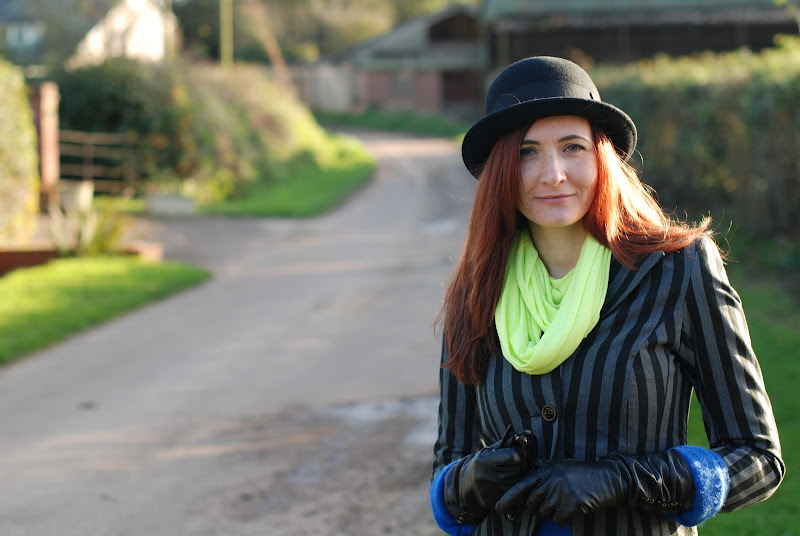 As far as I could see I was the only person wearing a bowler hat and stripy blazer – there’s very little chance of me turning up in the same outfit as someone else in the wilds of the Devon countryside. Especially teamed with a neon yellow scarf, which looks like a snood but isn’t – I simply tucked the ends down the back of my blazer. I prefer the neatness of a snood sometimes. If English isn’t your first language, which do you say – pants or trousers? I’m intrigued! Have just discovered your wonderful blog! I'm originally from India, but lived in the Middle East & Ireland before moving to Lincoln, UK three years ago. Obviously in India, we follow UK English, but I'm often surprised to discover how many American terms/pronunciations have crept into my English. And that's certainly because of all the American shows/movies I watch. For example, I find it very difficult to pronounce 'Garage' the British way. In India, we call trousers 'pants' and 'knickers' usually means shorts. Here's a good example of how these differences in regional English can cause embarrassment: A few months after an anaesthetist friend of mine arrived from India to work in Ireland, she met her boss on the beach. The next day, she told her colleagues that the boss was on the beach at the weekend in knickers. 🙂 Can you imagine their reaction? P.S. Looks like I have a lot in common with you. I'm 42 and your 'About' section may well have been written about me (except for the redhead bit). And I moved from a big city (Dublin) to a tiny village outside of Lincoln. Wow, I never knew that there were wellies this fashionable. Great outfit! I have black and white polka dot wellies. My husband will say are you going to wear your rain boots! Whatever you call them they sure as hell come in handy when it's pouring! I bet all eyes were on you in that fantastic outfit! You look so smashing in this outfit, Catherine. I have noted some charming differences in British/American fashion vocabulary, although I've always called rainboots "Wellies." I do refer to trousers as "pants", so I hope I haven't offended!